During any occasion, we need lots of gifts for our near and dear ones. Gifts are the items that have a deeper psychological impact on the memory than anything else. From kids to adults, everyone loves to receive gifts. However, not all gifts are suitable for everyone. People love gifts depending on their age, gender, personality traits, and tastes. Again, gifts could be anything but whatever they are, if they have utility values, they will be loved more. For men grooming item is a superb gift, not just because they are classy, but also highly useful. So, let us explore some of the best mens grooming kit gifts that you can choose anytime. Beards play an important role in trending male fashions. They like to keep them tiny and trim occasionally in a bit to bring gravity to their personality. 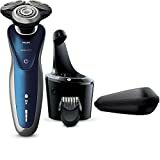 This item has integrated vacuum system with 18 secured length setting from 1/32 inch and a turbo power boost button, making it an exquisite beard trimmer that the user can utilize with some simple beard trimming tips. This hair clipper is famous for its 180 rotating head with a powerful lithium battery which lasts for about an hour without any electric cord attached to it. The stainless steel blades are of high quality with an amazing ability of shelf sharpening. This Hungary-made product delivers the perfect smooth shave you desire. It is a Skull Shaver product with exclusive look and effectiveness. This electric shaver can be an excellent choice as a gift. It is designed for face shaving and bald head. It uniquely clears the little hairs from bald heads with five sharp rotary cutters. It can last for 90 minutes for every charge. Barun BT5070 is a perfect beard trimmer for men who make a lot of journeys because it is cordless and rechargeable. It has 2 trimming combs that are detachable. Stainless steel blades are lifetime lasting and uniquely designed for precision details. A single charge for an hour can make it usable for 50 minutes. It is fully washable. 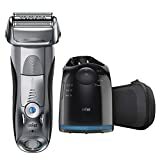 This one is designed for those who don’t like any mess during trimming as this hair trimmer has integrated vacuum system which keeps 90% of the mess inside. The self-sharpening blades are designed to trim each hair with precision. It has 20 built-in settings for length. This might be one of the best mens grooming kit gifts for those who experiment with various hairstyles. Braun Series 7790 is unique for its clever Sonic technology which allows it to increase its power automatically in the areas where the hair is denser. It can also capture flat hairs in in difficult areas. The OptiFoil technology can cut up to 0.05mm length of the hair with 100% waterproofing. Panasonic ES8103S Arc3 is can be an attractive gift item for men because of its effectiveness. 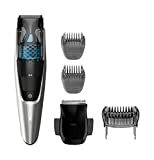 It has Nanotech blades for ultra-shaving experience with thin Arc foil which allows smooth shaving. The blades and its head glide softly on the skin. It has an ability to cut 13 thousand cuts in every minute with LCD display showing information. 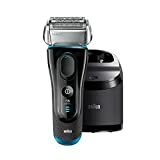 Braun is number one shaver brand in the world, and Braun Series 9 9090cc Electric Foil Shaver can be your gift choice not only because of its brand value, but because of its features and quality as well. Its main attraction is the intelligent SyncroSonic technology, which can do up to forty thousand cross-cuttings every minute. It is designed for all types of hair and if you’re still in doubt, you can study all aspects of a foil shaver. Not all shaving razors come with a cleaning system and this one does. It has a unique 3D contouring capacity with combined channels to cut longer hairs. For short hairs, the holes in it work perfectly. The jet cleaning system not only cleans the razor but also lubricates it. This razor can be an excellent gift item because it is both attractive and self-cleaning. It covers both wet and dry operations it has 4 blades with dual shaving system and precision with a 30-degree angle. Equipped with a hyper performance dual motor, it delivers 14 thousand cuts per minute. This feature-rich shaver from Philips has an alien-looking shape with the capacity to work in both wet and dry conditions. With the Gyroflex 3D system, it can contour in three ways. The Ultra Track head allows it to reach every single hair for cleaner shave covering 50% more of the skin. Braun is the official electric shaving brand for NFL and it is hugely popular. 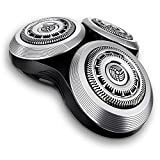 This particular product has three times better adaptation with FlexMotionTec which allows the user to put less pressure during shaving. Equipped with 20% more electric it can ensure fast cutting. 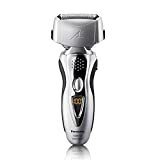 This particular item has been recently named as Shaver 6100 is equipped with a system of Gyroflex2D contour. It can adjust all the parts of the face with ease. It does not require a lot of pressure during shaving. It also has DualPrecision heads it can both trim longer and shorter hairs equally with efficiency. This one exquisitely designed for cutting up twenty percent more hair. It is immune to water, thanks to its AquaTec Technology with both dry and wet electric edition. The user can clean and lubricate it easily as it has the SmartClean system. With settings for five lengths, it offers the opportunity to play with any hairstyle one wants. 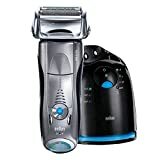 Braun is a renowned brand and this particular shaver edition of the company can be an attractive gift item. It has 3 separate modes for personalization. It can trim both flat lying and long hairs with its active lift capacity. Overall, the quality and look of the product make it an eligible candidate as a gift item. are always loved by all men no matter what their backgrounds are.